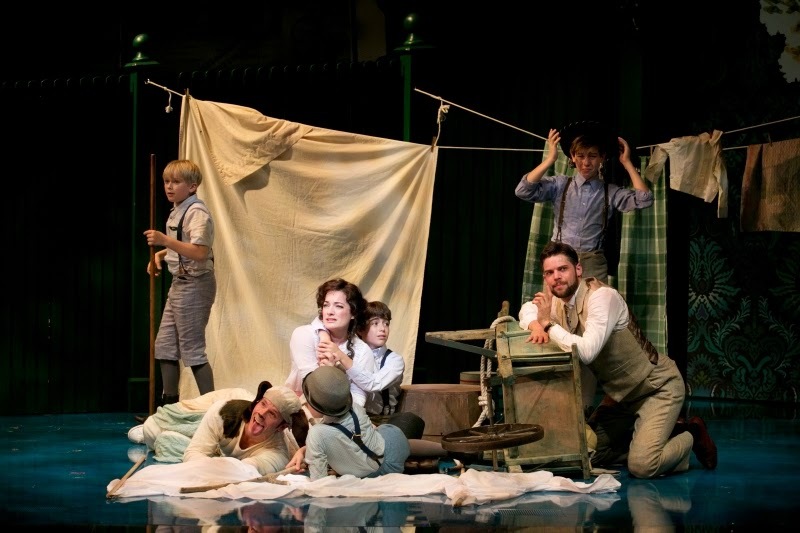 The Cast of "Finding Neverland"
Peter Pan not only never grows up, he never seems to fade away. To say that the new musical “Finding Neverland”, now aloft at ART, has been years in the making could hardly be called an exaggeration. And it’s well worth the time it took to evolve. They had us with the curtain, a gorgeously colorful promise of things to come, beginning with the first appearance of Tinker Bell, soon followed by the indescribably hilarious choreography and a show full of so many outstanding funny and moving moments that one doesn’t know where to begin. The history of J. M. Barrie’s masterwork is a full and varied one, from its initial success over a century ago in London, then on Broadway and the early days of television, then a beloved Disney film, and so on. With respect to this ART production, one can trace its most recent history to March 1998, when a non-musical version, “The Man Who Was Peter Pan” by Allan Knee, was produced by the 42nd Street Workshop for a limited run off-Broadway. A 2004 film, re-titled “Finding Neverland”, was nominated for seven Academy Awards including Best Film (and won for Best Score), with a screenplay by David Magee based on Knee’s play. Then there was yet another musical production, the predecessor to this ART presentation, with its world premiere outside London in 2012. Its reception was favorable but disappointing, so Harvey Weinstein, its savvy producer, made a decisive move: it was second star to the rewrite. With a revised libretto and a different creative team, this new and improved ART musical version is brilliant and breathtaking. ART’s Artistic Director Diane Paulus (having directed “Hair”, “Porgy and Bess”, and “Pippin”), has done it again. Along with the stunningly inventive choreographer Mia Michaels, she has helmed a new take on one of literature’s and theatre’s most beloved characters. For this production, the infectious Music and Lyrics are provided by Sir Gary Barlow and Eliot Kennedy, and the clever Book is by James Graham. The other technical credits include the ingenious Scenic Design by Scott Pask, the beautiful Costume Design by Suttirat Larlarb, the quite amazing Lighting Design by Philip S. Rosenberg, the complex Sound Design by Jonathan Deans, the effective Projection Design by Gilles Papain, the magical Illusions by Paul Kieve, the intricate Musical Supervision by David Chase and Musical Direction by Mary-Mitchell Campbell, the delightful Orchestrations by Simon Hale, and even the fascinating “Air Sculpture” (you’ll have to see this for yourselves) by Daniel Wurtzel. Set in London in 1903, this is a tale about belief, and not just in fairies. “Peter Pan, or the Boy Who Wouldn’t Grow Up” is the full title of Barrie’s original play, and the pertinent clue is in the subtitle of his most famous work. Barrie, played by Jeremy Jordan (of Broadway’s “Bonnie and Clyde” and “Newsies” and television’s “Smash”) is off-stage for only a few minutes, singing and dancing up a storm in a truly unforgettable tour de force performance. He and Sylvia Llewelyn Davies, beautifully portrayed by Laura Michelle Kelly (“Mary Poppins”) meet at Kensington Park as she is supervising the playtime of her four sons, Peter (Aidan Gemme), Michael (Alex Dreier), George (Sawyer Nunes) and Jack (Hayden Signoretti), all of whom, especially Gemme, are terrific. Her mother, Mrs. du Maurier, (a radiant Carolee Carmello) is opposed to the budding relationship. Charles Frohman (Michael McGrath, Tony winner for “Nice Work If You Can Get It”) almost walks off with the show as Barrie’s producer, even doubling in one scene as (Captain) James Hook. Barrie’s wife Mary (well played by Jeanna de Waal) rounds out the principal roles. The rest of the cast, most in several roles, include Courtney Balan, Dana Costello, Rory Donovan, Gaelen Gilliland, Thayne Jasperson, Josh Lamon, Melanie Moore, Mary Page Nance, Stuart Neal, Emma Pfaeffle, Jonathan Ritter, Tyley Ross, Julius Anthony Rubio, J. C. Schuster, Paul Slade Smith, and Ron Todorowski. Every one of them shines with the glow of pixie dust. Is it factual and true to life? No. As Lisa Chaney described the earlier film, in her biography “Hide and Seek with Angels: A Life of J. M. Barrie”, it “mocks history through its wanton (although admittedly Barrie-like) disregard for the facts.” Does it represent the real complexities of Barrie the author and adoptive father? No. In the spirit of the disclaimer at the beginning of the film version, this is “inspired by true events”. Those events are more than a bit altered. Minor differences include the fact that Barrie and Sylvia met not in a park but at a dinner table, and she had five, not four, boys (Nico is omitted); most significantly, her husband was very much alive at the time, not already deceased as in the film and this musical (giving Peter Davies some negative motivation because of the loss of his father). But the story, though based on historical events, is the stuff of fiction and fantasy, so factual accuracy walks the plank. All this without a single wire in sight, or out of sight. Neither Paulus nor Michaels take such a predictable step, having much more creative gifts to offer. If there’s a flaw in this production, it’s this: like childhood, it doesn’t go on forever. Mind you, all of this is no mere child’s play, for as C.S. Lewis said: “When I became a man I put away childish things, including the fear of childish things and the desire to be grown up.” After all, you’re only young once. Now “Finding Neverland” is off and running, or soaring, at ART, but only until September 28th. Whether or not you believe in fairies, you’d best stop reading and order your tickets. Already announced for a Broadway run starting in March, this show surely deserves never to grow old, but to go on, so long as children are happy and innocent, straight on till morning.